This is the best compact crossover for you if you prioritize good performance and features per dollar over interior room and fuel economy. Sportage returns for 2018 with minor updates following a full model-year 2017 redesign. Topping the 2018 changes, the entry-level LX model is now available with autonomous emergency braking as part of its newly optional Technology Package. The package also includes blind-spot and rear cross-traffic detection, power-folding outside mirrors with turn-signal indicators, and lane-departure warning. These features were previously available only on the midlevel EX and top-line SX models. See the “Features” section below for more details on model-year ’18 updates. Now in its fourth design generation, Sportage is Kia’s longest-running vehicle nameplate in the U.S., having bowed for model-year 1995, just one year after Kia began selling cars in North America. It was the first crossover sold here by a South Korean automaker and used old-school, truck-type body-on-frame construction. It was among the most affordable SUVs of its time, but you got what you paid for: it was cheaply made, unreliable, and fared poorly in crash tests. It became a crossover with a model-year 2005 redesign that switched to car-type unibody construction. Then, as now, Sportage shares much of its basic engineering with the Tucson produced by Kia’s corporate partner, Hyundai. Don’t feel bad if you don’t recognize the kinship: Sportage and Tucson not only have different styling, they also have different drivetrains and feature sets. Compact crossovers are the rage and Tucson and Sportage sales have increased markedly in the wake of their respective model-year 2016 and 2017 redesigns. Still, they haven’t been able to match the sales pace set by competitors such as the Ford Escape, Honda CR-V, Nissan Rogue, and Toyota RAV4. Seriously consider a 2018. Though mostly a carryover, the driver aids newly available for the least expensive model, plus enhancements to the EX and SX, are welcome upgrades. The 2019 Sportage will likely be a virtual rerun of the ’18, although it’ll probably cost more. Its styling will also have a shorter shelf life, with a midcycle refresh on tap for model-year 2020. Don’t expect a full redesign before model-year 2023, though. Returning for 2018 are base LX, volume-selling EX, and sporty SX trim levels. All have a four-cylinder engine – the SX’s is turbocharged — and come with front-wheel drive. Traction-aiding all-wheel drive (AWD) is optional across the board. Styling: The 2018 Sportage looks exactly as it did for the 2017 model year, when the redesign imbued it with a lot more attitude than its predecessor. The sweeping headlights are reminiscent of the premium-class Porsche Macan crossover — maybe no surprise, considering Sportage’s styling comes from Kia’s German design studio. The brand’s signature “Tiger Nose” grille got a fresh look for ‘17, and top-line SX versions sport an “ice-cube-tray” arrangement for the standard LED fog lights. The downside of this crossover’s muscular profile is a low roofline that makes the rear seating area feeling somewhat claustrophobic. The interior is well executed. Instruments are large and brightly lit. Primary climate and audio controls are logically arranged, and we appreciate the large typeset, which enhances at-a-glance legibility. Kia’s UVO infotainment system is standard on the EX and SX and an option we would very much recommend on the LX. It’s among the more intuitive setups in the competitive set and includes support for Apple CarPlay and Google Android Auto. Imbedded GPS mapping is available on the EX and standard on the SX. While the 2017-18 Sportage is more accommodating than its predecessor, it still ranks below the class average for passenger and cargo room. It’s not uncomfortable by any stretch, but the cabin lacks the airy feel of a CR-V or RAV4. With slightly more than 60 cubic feet of cargo volume with the rear seats folded, you’ll need to pack more judiciously than you would in most rival compact crossovers. Mechanical: Sportage’s two available engines are unchanged from 2017. LX and EX models have a 2.4-liter four-cylinder with 181 horsepower and 175 pound-feet of torque. The SX is one of the more powerful compact crossovers, with a 2.0-liter turbocharged four of 240 horsepower (237 with AWD) and 260 pound-feet of torque. The sole transmission for all models is a six-speed automatic. Hyundai’s Tucson makes do with smaller, less-powerful engines, a key difference between these corporate cousins. Both Sportage and Tucson, however, have a AWD system that enables drivers to lock in a 50/50 front/rear torque spilt for enhanced low-speed traction on snowy roads. Sportage LX and EX accelerate roughly on par with compact crossovers of similar power. The SX accelerates with far more gusto than the LX and EX, though it’s not quite as lively as turbo models with similar horsepower offered in the Ford Escape and Subaru Forester lines. Blame Sportage’s portly curb weight: all models are among the heaviest in the competitive set, with the AWD SX checking in just a few pounds shy of two tons. On the upside, the transmission is well-sorted, and SX models include steering-wheel paddles to facilitate manual gear changes. Engineers dramatically improved Sportage’s road manners for 2017. It still doesn’t handle as well as a CR-V or Mazda CX-5 or does ride as smoothly as a Rogue or Forester, but neither is compromised enough to be a potential deal-breaker, as they were in the previous-generation Sportages. Features: Sportage continues in the Kia tradition of offering a lot of features for the money, and the company enhances the value proposition for 2018. Headlining is the newly optional Technology Package for the entry-level LX, which includes blind-spot alert with rear cross-traffic detection, power-folding outside mirrors with turn-signal indicators, lane-departure warning, and autonomous emergency braking. These features had been exclusive to the EX and SX and their expansion for 2018 makes all Sportage models eligible for Top Safety Pick status from the Insurance Institute for Highway Safety. Other updates include introduction of an electronic parking brake for the SX. Heated outboard rear seats join the Technology Package available on EX models. Due later in the model year is the EX Sport Appearance Package. It’ll include LED taillights and fog lights, gloss-black grille, silver front and rear skid plates, and metal-trimmed gas and brake pedals. Returning as standard equipment on all models are LED daytime running lights, rearview camera, and Bluetooth connectivity for phones and audio streaming. EX models gain leather upholstery with heated front seats, blind-spot alert with rear cross-traffic detection, a 7-inch touchscreen display with support for Kia’s intuitive UVO infotainment system, Apple CarPlay, and Google Android Auto. In addition to the turbocharged engine, the just about fully loaded SX has a power panoramic sunroof, 8-inch infotainment screen with imbedded GPS navigation and upgraded Harman/Kardon audio system, a full suite of driver-assistance safety features, front- and rear-obstacle detection, ventilated front seats, and heated steering wheel. Oddly, the EX’s new heated rear seats are not offered on the SX. Year-over-year inflation sees 2018 Kia Sportage base prices increase $100-$600, depending on trim level. Base prices include Kia’s $895 destination fee. With front-wheel drive, the ’18 Sportage LX starts at $24,395, the EX at $27,195, and the SX at $33,695. All-wheel drive is a $1,500 option for all. We recommend it for its added measure of dry-road grip, not to mention the traction benefits it can provide in the wet and snow. 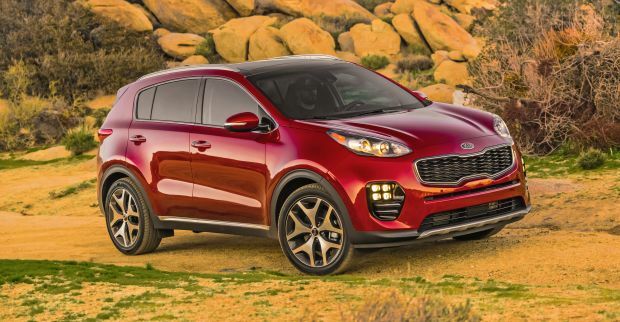 Key Sportage options come in packages. For the LX, the $1,200 Popular Package adds the EX’s 7-inch dashboard touchscreen with CarPlay and Android Auto support, dual-zone automatic climate control, 10-way power driver’s seat, heated front seats, and roof rails. You must order this package to gain access to the $1,300 Technology Package, which includes the driver-assistance features we mentioned above. EX models offer the $1,700 Premium Package, which includes a panoramic sunroof, LED interior lighting, heated steering wheel, and auto-dimming rearview mirror with built-in garage-door transmitter. The Premium Package is required in order to add the $3,000 Technology Package. Among this package’s features are the aforementioned heated rear seats, ventilated front seats, driver aids, power-passenger seat, hands-free power rear liftgate, front- and rear-obstacle detection, and 8-inch infotainment system with built-in navigation and Harman/Kardon audio. The new EX Sport Appearance Package will list for $990. SX models have no extra-cost factory options. Sportage pricing still tracks lower than most rivals, but the difference is not as dramatic as it has been in years past. For example, at $33,395, a loaded AWD EX is just a few hundred dollars less than a comparable Honda CR-V Touring, which offers superior passenger comfort, cargo room, and fuel economy. Similarly, the Sportage SX is priced in the same ballpark as comparably equipped, high-output turbo versions of the Escape and Forester. 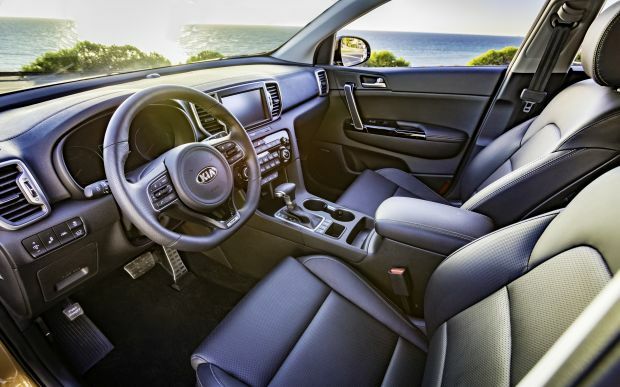 Saying that, the AWD LX with Popular and Technology packages is an outstanding value at just $28,395, especially when you factor in Kia’s strong warranty and roadside assistance coverage. That would be our pick. Burdened by a relatively heavy curb weight, Sportage’s EPA fuel-economy ratings put it near the bottom of the competitive set. Only one configuration manages to crack 30 mpg highway, the front-drive LX, at 23/30/26 mpg city/highway/combined. With AWD, the LX rates 21/25/23 mpg. Despite sharing an engine with the LX, the EX has 18-inch wheels and tires versus the LX’s 17s. The 18s are heavier, have greater rolling resistance, and detract from aerodynamics. The result are lower EPA ratings for the EX, at 22/29/25 mpg with front-wheel drive and 21/25/22 with AWD. SX models are among the least fuel-efficient compact crossovers, rating 21/26/23 mpg city/highway/combined with front-wheel drive and 20/23/21 with AWD. Only V-6 Jeep Cherokee models weighed down with off-road-ready AWD systems rate lower. All Sportage models use regular-grade 87-octane gasoline. Probably nothing until model-year 2020, when it should receive freshened exterior and interior styling. Don’t expect major content changes; all versions are already available with a fairly comprehensive feature set. 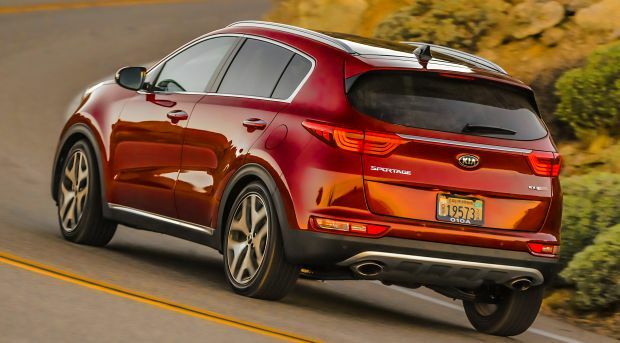 Unfortunately, Kia probably won’t address Sportage’s weight disadvantage, and it’s unlikely to revise the powertrains, until the next-generation model debuts around model-year 2023. Hyundai Tucson: Sportage outshines its corporate cousin by virtue of its more powerful, more refined drivetrains and more user-friendly infotainment system; Jeep Cherokee: Sportage can’t match Cherokee’s off-road prowess, but Kia beats it for roominess, reliability, and customer satisfaction ratings; Mitsubishi Outlander: larger than Sportage, but much less refined. Honda CR-V: Honda nailed the compact-crossover equation two decades ago with this space-efficient, fun-to-drive, high-value vehicle, and with the model-year 2017 debut of this fifth-generation model, it’s cemented its dominance; Mazda CX-5: roomy, agile, economical, and gorgeous, the CX-5 is the thinking buyer’s alternative to the higher-profile players in this heated market segment; Nissan Rogue: slower than Sportage but impressive for ride quality, flexible passenger and cargo accommodations, and value pricing.